We work closely with eXp Realty to provide agent support, website development, and branding. This Virginia state site is managed by David Harbour State Broker. The site serves a dual goal of providing a useful property search with agent education. The Estate theme used on this site is integrated with Wolfnet property search to create the search form at the top of the main page. Then search and property request pages were added. The background image, cropped to 1920px wide, helps the layout. 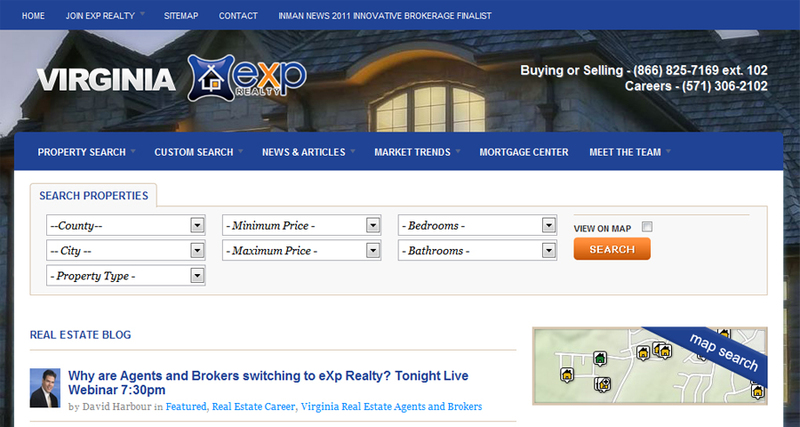 The go to eXp Realty Virginia state website for consumers and agents. David’s big into video which embedded into many of the posts and pages. We keep SEO in mind and continue to improve quality inbound links.